Can you believe it's that time of month again! Here is my submission for the Facebook Fan Page Challenge. All supplies are from my stash. The image is an SBS image called Witch Mercedes and I've colored it with Copic markers. I am a follower of all these blogs and have current badges listed here. Absolutely stunning! Gorgeous coloring and the card is awesome!! oh love this, great colors.. wonderful card!! As always an awesome card my friend. WOW!!! STunning for sure! WOW Ema this is bee You TEE Full!!! 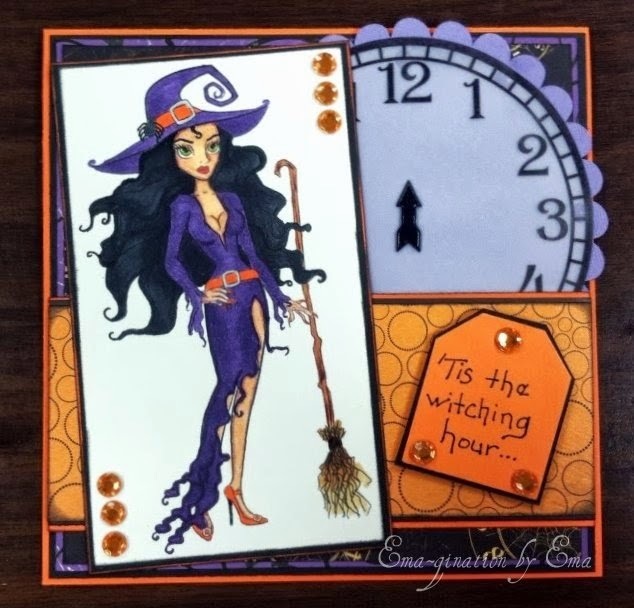 I so want this image, I love that witch! You colored this beautifully and the card all together flows nicely. Well done! Thanks for linking this card up in our challenge this week at Jo's FFC!